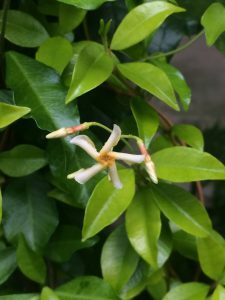 A cute gold leaved form of asian star jasmine that makes a dainty evergreen vine for trellis. Bone colored lightly fragrant flowers occasionally occur in late spring. To 9′ tall and 3′ wide in 7 years. Rich, well drained soil with regular summer water. Part shade. May be self clinging in wind free situations. Very very cold hardy and drought tolerant when established. Valuable little vine for shade.